But does the LSAT in fact measure the right stuff? Jeffrey Brand, dean of the University of San Francisco School of Law, said that the research is welcome. Brand…said that passing the bar exam is clearly important. “But we also need lawyers with the kind of skill sets that the world needs — like empathy, persuasiveness and the willingness to have the courage to do the right thing — which the LSAT does not measure,” Brand said. Proponents of alternatives to the LSAT will no doubt have tough negotiations ahead of them as they endeavor to persuade the legal community of the merits of utilizing other measurement tools to predict effectiveness in law school and beyond. I wish them success: the legal profession and the public it serves can only benefit from this closer inquiry into what it takes to be an effective lawyer today. Now available online is the latest edition of The Complete Lawyer, a web-based magazine focusing on quality of life and career satisfaction for attorneys, along with its special ADR column, “The Human Factor“. This issue of The Complete Lawyer discusses “The Brave New World of Associates.” Articles include “Jettison the Myth of Individualism“, reflecting on the importance of building social capital. “The Human Factor” focuses on ADR from the perspective of four attorneys who mediate – me and three colleagues, Stephanie West Allen of Idealawg and Brains on Purpose, Gini Nelson of Engaging Conflicts, and Victoria Pynchon of Settle It Now Negotiation Blog. After writing the first three columns together, each of us will now solo, starting with Gini Nelson, who takes this issue of “The Human Factor” to discuss how “Joining A New Firm Is Like Traveling To A Foreign Country“. Then it’ll be my turn for the following issue. The Complete Lawyer is published by Don Hutcheson, who has been an enthusiastic supporter of “The Human Factor” from the beginning. Thanks, Don, for being such a good friend to the four of us. The latest issue of The Complete Lawyer, an online journal focusing on quality of life and career satisfaction for attorneys, is now available — and along with it, its special ADR column, “The Human Factor“. This issue of The Complete Lawyer asks, “What’s your exit strategy?” and looks at how best to plan financially and emotionally for retirement. “The Human Factor“ focuses on ADR from the perspective of four attorneys who mediate – me and my three extraordinary colleagues, Stephanie West Allen of Idealawg and Brains on Purpose, Gini Nelson of Engaging Conflicts, and Victoria Pynchon of Settle It Now Negotiation Blog. This time in “The Human Factor” the four of us discuss “What we have learned from mediation and negotiation that can have very broad application in your life and work“. The Complete Lawyer is published by Don Hutcheson, to whom the four of us owe a debt of gratitude for allowing us a forum for our ideas. Thanks, Don. What About Clients? No, What About Paris? 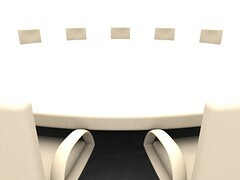 Posted on May 11, 2008 | Comments Off on What About Clients? No, What About Paris? Brevity, said the Bard, is the soul of wit. If you seek proof of the truth of that maxim, then look no further than What About Clients?, one of the very best of the legal blogs. Irreverent, edgy, and smart, with a keen international focus, What About Clients? has long made the case that in a flat world, savvy American lawyers eager to retain their competitive edge must look beyond U.S. borders and across the seas for news, ideas, and business. Practicing what it preaches, WAC? recently assumed a new name (What About Paris?) and a new slogan (“News and ideas on clients, customers, business and law around the globe”). What remains unchanged of course are the crisp writing, dangerously sharp ideas, and the extensive list of international blogs in the site’s sidebars. Comments Off on What About Clients? No, What About Paris? 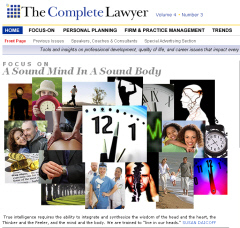 “A Sound Mind in a Sound Body” is the theme of the latest issue of The Complete Lawyer, an online magazine covering professional development, quality of life, and career issues for attorneys published by Don Hutcheson. It explores ways to reduce stress; a look at nontraditional careers; and the link between mind and body for better quality of life. The last issue of The Complete Lawyer introduced “The Human Factor“, a column focusing on ADR from the perspective of four attorneys who mediate – me and three talented colleagues, Stephanie West Allen of Idealawg and Brains on Purpose, Gini Nelson of Engaging Conflicts, and Victoria Pynchon of Settle It Now Negotiation Blog. In our latest Human Factor column, the four of us describe the different paths that led us from law school to the practice of mediation. The Complete Lawyer — an online magazine covering professional development, quality of life, and career issues for attorneys published by Don Hutcheson — has added an ADR column, “The Human Factor“. 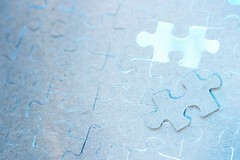 Located in different parts of the U.S., each of us offers a unique way of looking at ADR and its connection to law and justice, in particular what that connection means for the human factor — the individuals whose lives the law affects. In our first column, we introduce ourselves to readers and let them know what to expect from future issues. Besides “The Human Factor”, there’s plenty more worth reading at the latest issue of The Complete Lawyer, which focuses on the question, “What Do Women Lawyers Really Want?” (I’m one, and I’m still not sure myself.) Find out the answers by visiting The Complete Lawyer now. As family lawyer Diana Skaggs recently alerted readers, the nation’s leading divorce lawyers are finding more cases settled before trial. This trend in favor of negotiation over litigation in divorce may in part be attributable to the growing popularity of alternatives such as mediation and collaborative law which emphasize mutual gains, joint problem solving, and better communication between disputants. In “Lawyers who mediate, not litigate: Collaborative law doesn’t have to be an oxymoron“, a column in today’s Christian Science Monitor, Boston-based collaborative lawyer David Hoffman traces the roots of collaborative law, describes its benefits, and assesses its risks. Its benefits are two-fold: for the clients themselves, who can achieve creative resolutions, as well as for the legal profession itself, since Hoffman sees collaborative law as a way to regain ebbing public confidence. Hoffman does so in the context of the ethics opinion recently issued by the American Bar Association upholding the use of collaborative law agreements by lawyers–an opinion which put to rest concerns among collaborative lawyers raised by a controversial advisory opinion by the Colorado Bar Association which declared collaborative law unethical per se earlier this year. Although collaborative law — and other nonadversarial processes like mediation — may not be for everyone, many divorcing couples are electing these as a way to avoid the costs — monetary and otherwise — that litigation can produce.